Bradley Beal led the Wizards with 24 points while Otto Porter chipped in with 23 and Kelly Oubre added 19 as the Wizards knocked off the Philadelphia 76ers 109-94 on Sunday night. Tomas Satoransky ended the evening with 10 assists while Marcin Gortat added a double-double as the Wizards snapped the 76ers seven-game winning streak. After a sloppy first quarter, the Wizards put the clamps on the 76ers in the second quarter holding them to just 20 points as they took a 67-48 lead at the half. After a back and forth first quarter, Washington started the second quarter on a 10-0 run as the Wizards pushed the lead out to double figures. It was the bench, led by Kelly Oubre who jumpstarted the run. He hit a 3-pointer to get things going, then Mike Scott hit a pair of circus shots to get Washington on a roll. Otto Porter, who was just 1-3 from the field in the first quarter, scored 14 points on 6-of-7 shooting as Washington took a stranglehold on this game. Porter made some very timely cuts through the paint and hit some timely 3-pointers, including one to end the half. ALL OTTO PORTER DOES IS BEAT THE BUZZER. Otto Porter and Kelly Oubre were a problem for the 76ers this evening. Oubre, who’s seemed to wake up from his slump prior to the All-Star Break knocked down his first four field goal attempts as well as three of his first four attempts from downtown. As mentioned, after a slow start, Porter connected on 6-7 shots for 14 second-quarter points as both guys had 16 at the break. Otto Porter stayed aggressive in the second half as well and continued to stay hot from three-point range in addition to attacking the hole. When one of these guys plays well for the Wizards, it often ends up in a victory. When both of these guys turn in remarkable games, it’s a major issue for the opposition. Washington came into the game averaging 24 assists per contest. They notched their 24th assist of the contest at the eight-minute mark of the third quarter en route to 35 dimes for the night. To no one’s surprise, Tomas Satoransky led the team with 10 assists, just one short of his career-high and Bradley Beal, who’s become much more of a facilitator since Wall has been out dished out eight dimes of his own. In the first half, the ball never got stuck and was swinging from side to side resulting in some wide-open three-point attempts. The pick-and-roll with Beal at the helm was working as well as the Wizards catching Philadelphia sleeping and getting some easy baskets on some nice backdoor cuts. Four other Wizards players had at least three assists tonight as the Wizards have notched 25+ assists in 12 of their last 13 games. The Wizards had no answer for Joel Embiid who scored 25 points to go along with 10 rebounds as the mountain of a man could not be stopped in the painted area. Thankfully the Wizards were able to push him out to the perimeter more than he would have liked which kept his efficiency down enough to keep him from making this one close. Next up: The Wizards hits the road to take on the Bucks on Tuesday at 8 p.m. ET. Wizards at Sixers Final: Wizards’ Hack-A-Simmons strategy erases deficit, but Wiz fall to Sixers, 118-113. The Wizards were this close to completing one of the most bizarre comebacks. With over five minutes remaining in the fourth quarter, the Wizards went to the hack-a-Simmons strategy on 12 straight possessions. Washington, once down 24 was able to the trim the lead to three, 100-97 as Simmons missed many of those free throws. And every time it looked like the Sixers had a comfortable lead, the Wizards managed to stay within striking distance. The strategy worked as it gave Washington a fighting chance, but the comeback would fall short as they’d lose, 118-113. No Wall, no Beal, no chance. Midway through the first quarter, Jerryd Bayless went up for a layup swinging his off arm, knocking Bradley Beal in the face. Beal exited the game and was out for the rest of the first half (he did return in the second half) but that killed any chance the Wizards had of winning this game. Washington, who only mustered up 91 points just one night prior had tons of issues scoring once Beal went down. Chalk it up to tired legs and the rest of the starters having another off night, the Wizards officially had no offense with their best scorer down. The Wizards looked to push the pace and tried to get some easy baskets in transition but that didn’t do the trick. The lid was on the cup early in this game as once again, the team started 4-16 from the field. Beal came back to play in the second half and ended the night with 21 points, but it was too little too late. Yes, Philadelphia is the best rebounding team in the NBA, however, the Wizards showed no life on the glass this evening. Washington was crushed on both ends as they were outrebounded 35-14 in the first half and 64-35 for the game. No starter grabbed more than four rebounds tonight and it was Tomas Satoransky who led the team with eight boards. Philly crashed the glass, to the tune of 21 offensive rebounds that often ended up in easy put backs right at the rim. It’s already tough to keep Philly of the glass, and the Wizards did themselves no favors tonight. This and rebounding often go hand in hand. When you give up 16 offensive rebounds, you often tend to give up many easy baskets in the lane. Joel Embiid and Dario Saric did most of their damage in the midrange but it was Ben Simmons who had no problems getting to the rim tonight. Morris started off the game guarding Simmons and was no match for the rookie. Morris often went under screens in hopes of forcing Simmons to shoot but Simmons was still able to navigate his way to the hole. After a nice game from Ian Mahinmi last night, he wasn’t able to provide any rim protection either. The Sixers scored 54 points in the paint tonight and already notched 32 by halftime. You’re not going to win many games when your opponent puts up that kind of numbers. For the second straight night, Tomas Satoransky outplayed Tim Frazier. It’ll be interesting to see if Satoransky gets more and more of Frazier’s minutes as the season rolls along. Jodie Meeks scored a season-high 21 points but it was too little too late as most of those came with the game already out of hand. 76ers at Wizards Final: Washington hangs on to beat ‘The Process’ in the opener, 120-115. This one didn’t feel like the season opener. Nope, this one had the feeling of a first-round playoff matchup. John Wall led the Wizards with 28 points and Bradley Beal scored 25 as the Wizards hang on to beat the 76ers, 120-115. Marcin Gortat played one of his best games in years with 16 points and 17 rebounds while the reserves combined for 41 points led by Kelly Oubre and Jodie Meeks with 14 a piece. I thought the young 76ers might come out and cough the ball up until the early game jitters wore off but that wasn’t the case. Ben Simmons, who looked like he might be rookie of the year and Joel Embiid took it right to Washington early. But John Wall and co. weren’t having it. Although his shot wasn’t falling, Wall got his teammates involved as he had four assists in the opening quarter and imposed his will to score evidenced with this backdown dunk. Washington led 32-23 after one. The reserves, a huge question mark coming into this season showed signs of improvement. They did not play well in the early moments of the second quarter on defense but held their own on the offensive end. Kelly Oubre knocked down three of his first four three-pointers while Jodie Meeks also provided a scoring punch but it was the 76ers that led, 59-56 at halftime. Bradley Beal, who had a cold first half, came out guns blazing to start the third quarter. Beal scored nine points in the first five minutes of the half for the Wizards. After few transition opportunities in the first half, Wall was able to get out for some nifty fastbreak layups to stretch the Wizards lead to eight, 82-74. 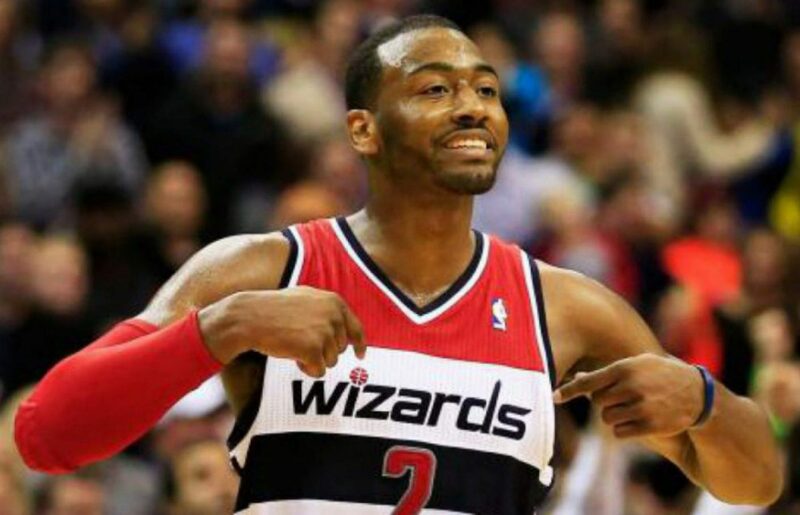 Wall and Beal would combine for 25 points in the period as the Wizards led, 90-82 entering the fourth quarter. Philly was on fire to start the fourth quarter. The 76ers hit their first four three-pointers of the period to shrink the Wizards lead to two, 102-100 in an instant. And that’s when the Wizards turned this one around. Careless passes from the young 76ers led to highlight reel plays on the other end for Washington. It looked like the Wizards had this one in the bag as they led 115-108 with just over a minute to play. But again, Washington would have to survive one more barrage of three-pointers. With the Wizards up two and Philadelphia looking to score in transition, Beal poked the ball free and Otto Porter was there to save it from going out of bounds. Philly sent the Wizards to the free throw line and that would be it as Washington would close this one out. Wizards win the opener, 120-115. Mike Scott played well knocking down a three-pointer off the bench as well as a few floaters in the lane. Ian Mahinmi played solid defense while Tim Frazier added five assists. This was easily one of the best performances from the reserve unit as a whole in recent memory. Jason Smith started the game but got injured early on. Regardless, he was pretty ineffective. After the Smith injury, Oubre and Scott spent the remainder of the game in the power forward position. Oubre took advantage of the increased playing time with 14 points and eight rebounds in 32 minutes of play. It’ll be interesting to see if Scott Brooks opts to start Oubre or continue bringing him off the bench. Wizards comeback falls short, lose to 76ers 120-112. The Wizards make a furious 4th quarter comeback but ultimately, fall short to the 76ers, 120-112. John Wall (29) and Bradley Beal (40) combined for 69 points as the Wizards found themselves down by 22 and it would be too much to overcome. This one stings as Joel Embiid did not play for the 76ers tonight. This game started off the way you’d think a game against two teams who hadn’t played in eight games would start off. A lot of missed shots, silly turnovers, and poor defense all around. The Wizards finally got their legs underneath them behind a combined 18 points from Wall and Beal as they led 28-26 after one. The 76ers had things going as they opened the second quarter up on a 10-2 run. The Washington bench was awful tonight combining for just 11 points for the game and allowed Philly to build on their lead. The Sixers outscored the Wizards 35-21 in the period to take a 61-49 lead into halftime. Washington was able to get their scoring going in the third quarter but the issue was, they couldn’t stop the Sixers. The Wizards were able to cut the lead down to 12 on several occasions but Philadelphia would go on a run to stretch it back out to 17. The Sixers led 95-81 after three as this one looked all but over. The Wizards would not go away though. A furious fourth quarter rally behind big buckets from Wall and Beal kept the Wizards in the game. Washington got the game to as close as four points, 116-112 with 22 seconds to play but couldn’t cut into the lead anymore. Philly wins 120-112. This was not the way the Wizards wanted to start the post All-Star game stretch. Outside of Wall and Beal, no Wizards’ player hit double figures in scoring until the fourth quarter. Morris and Gortat ended the night with 14 and 11 points respectively but it was Wall and Beal who stole the show with a combined 69 points. Porter, who’s usually automatic from three-point range, was just 1-5 from distance and could never really get going. The Washington bench combined for just 11 points and nine rebounds tonight. In a nutshell, they were awful. They didn’t stretch the lead when the starters were out forcing Scott Brooks to play starters extended minutes alongside the reserves. Newly acquired Bojan Bogdanovic couldn’t get going tonight as he was just 1-5 from the field.